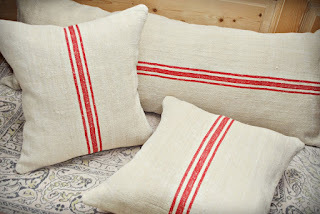 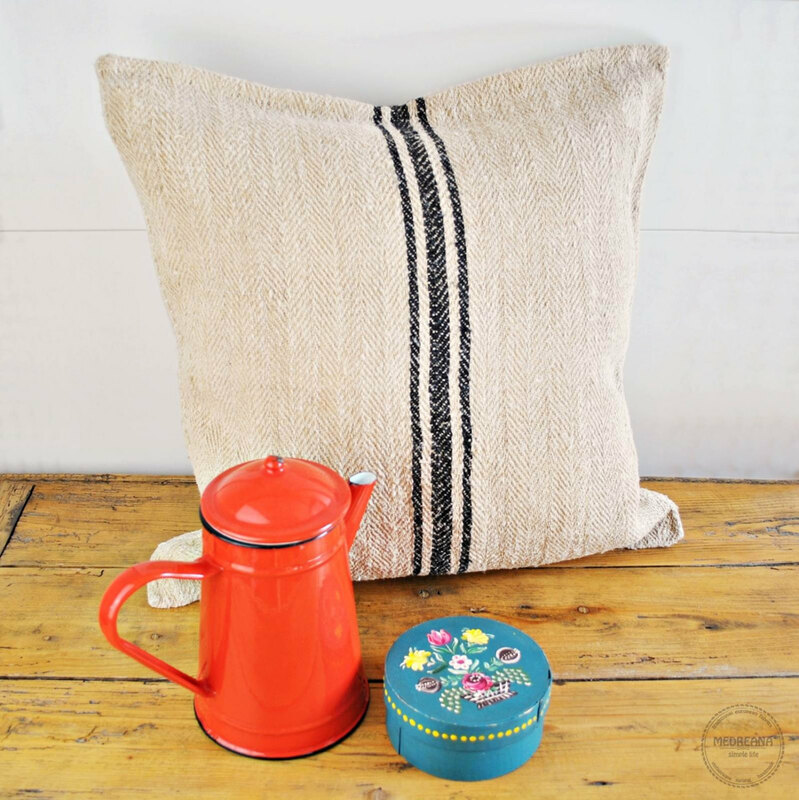 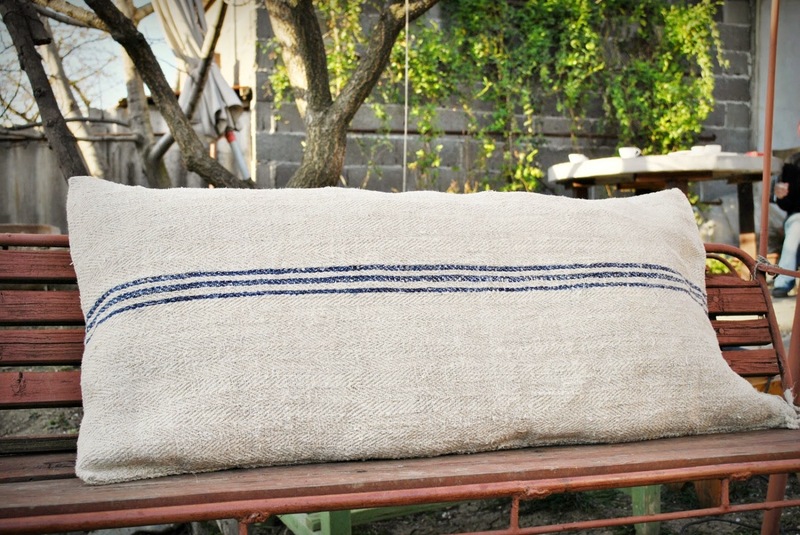 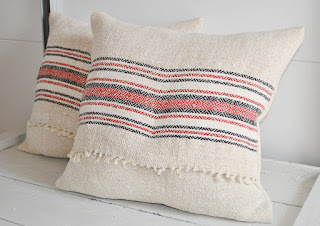 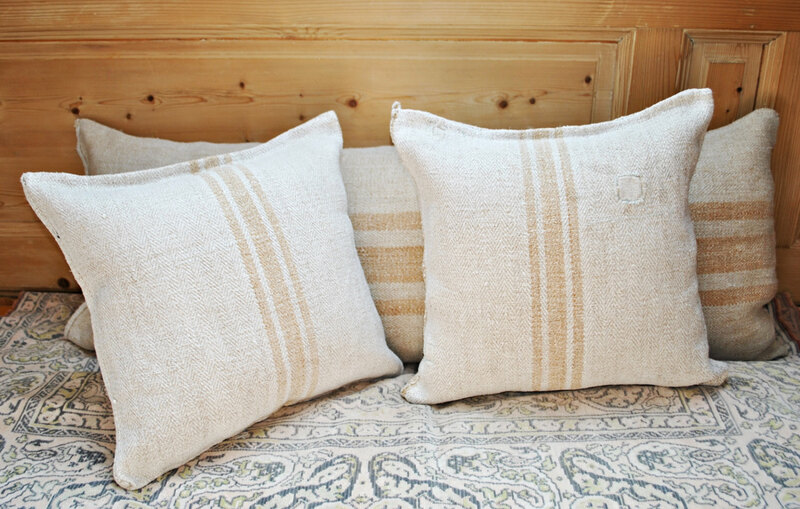 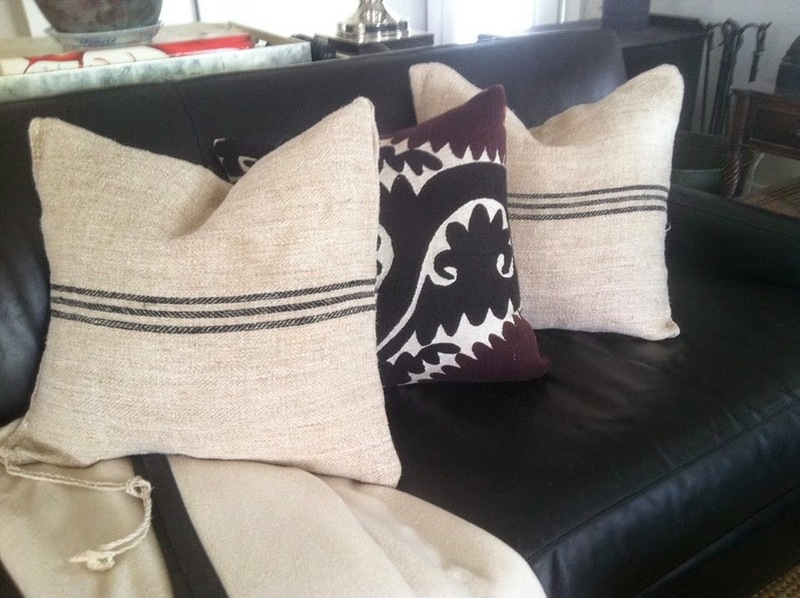 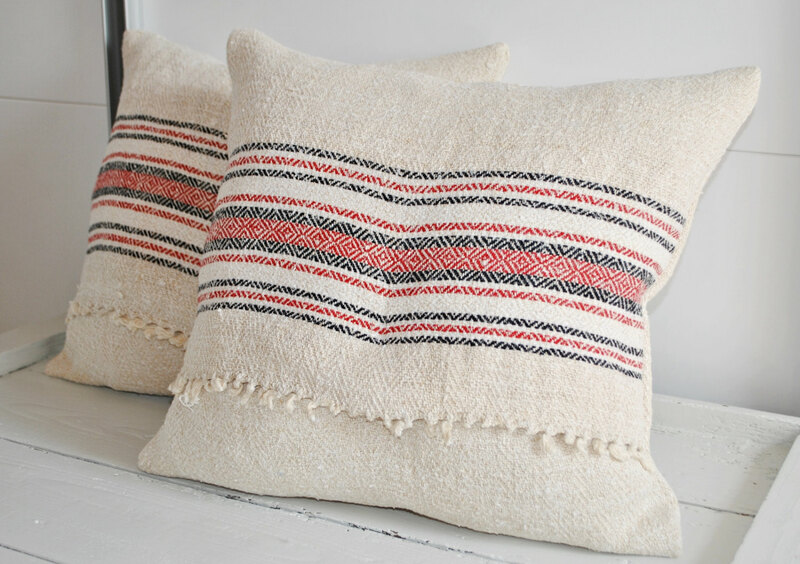 Made from a beautiful antique/vintage hand-woven hemp grain sack from Europe, the textile dates from the early 1900's. 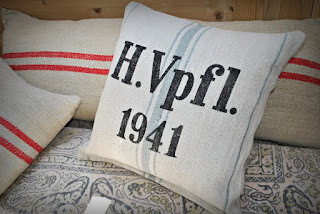 It would be a great holiday accent pillow or simply fit well into your farmhouse or rustic decor. 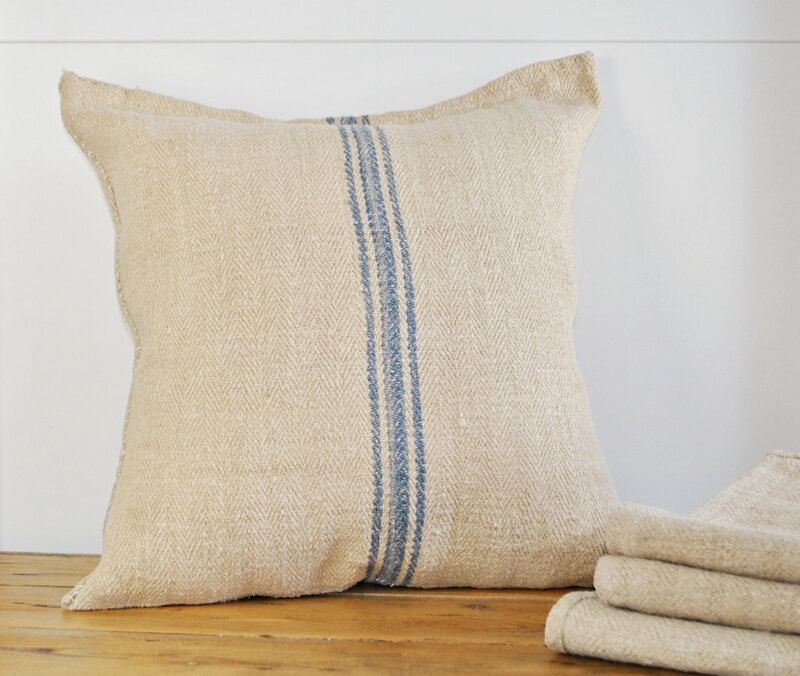 MATERIAL AND COLOR: Medium hemp linen material, hand loomed. 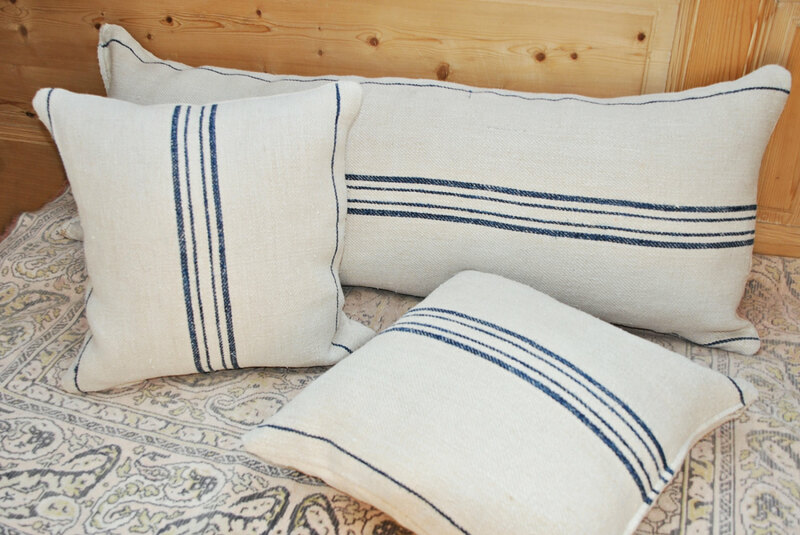 Blue stripes. 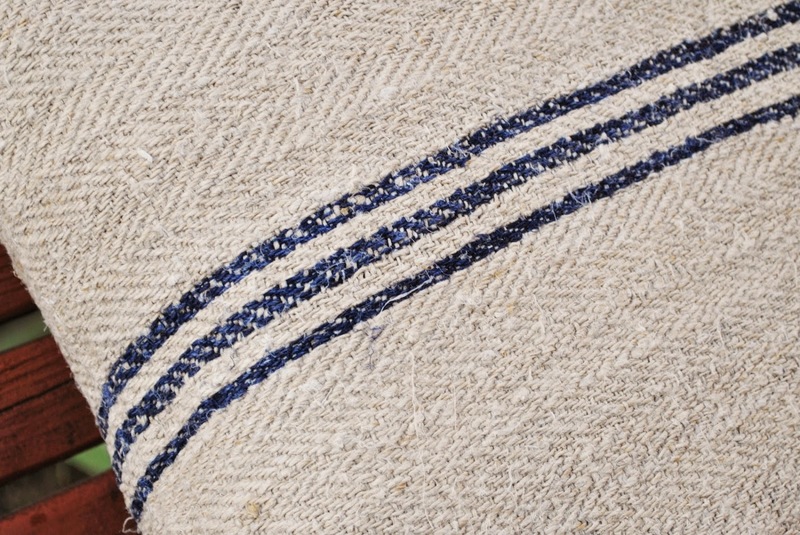 The stripes are handwoven on both sides. 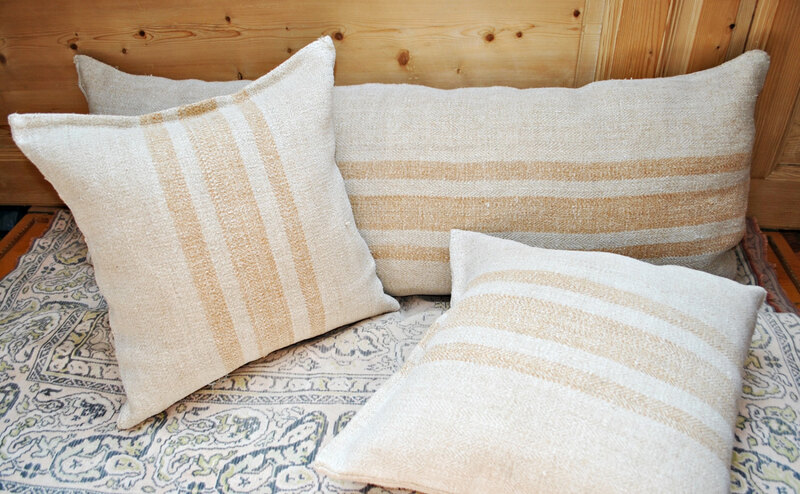 The fabric's tone is a light natural oatmeal tone. 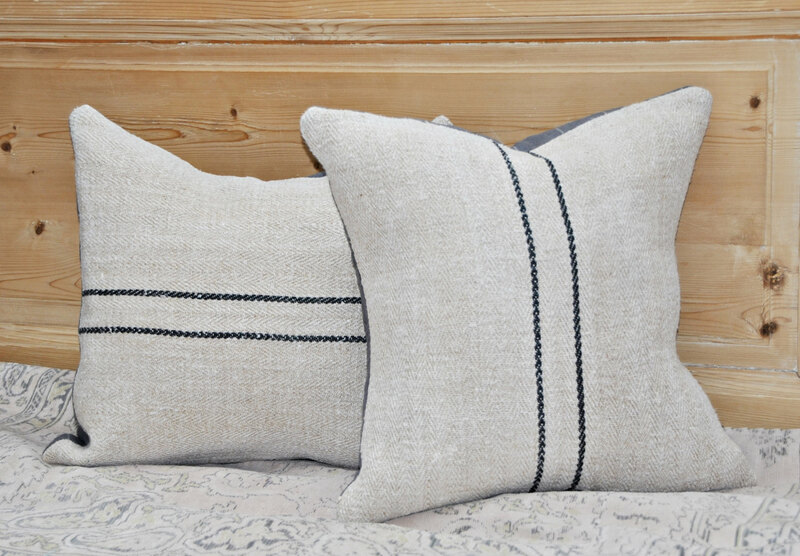 TEXTURE: Medium weight textured fabric. 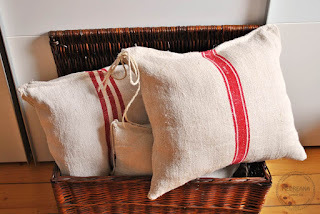 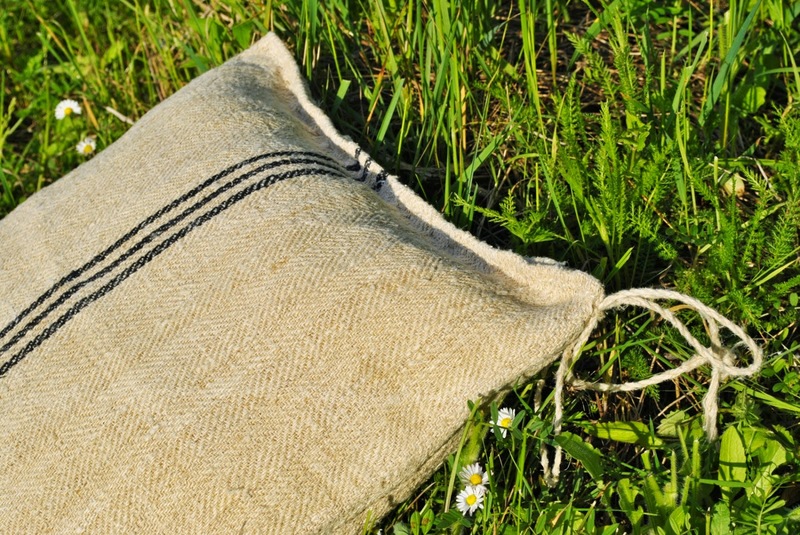 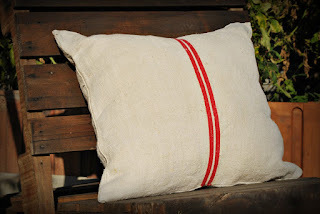 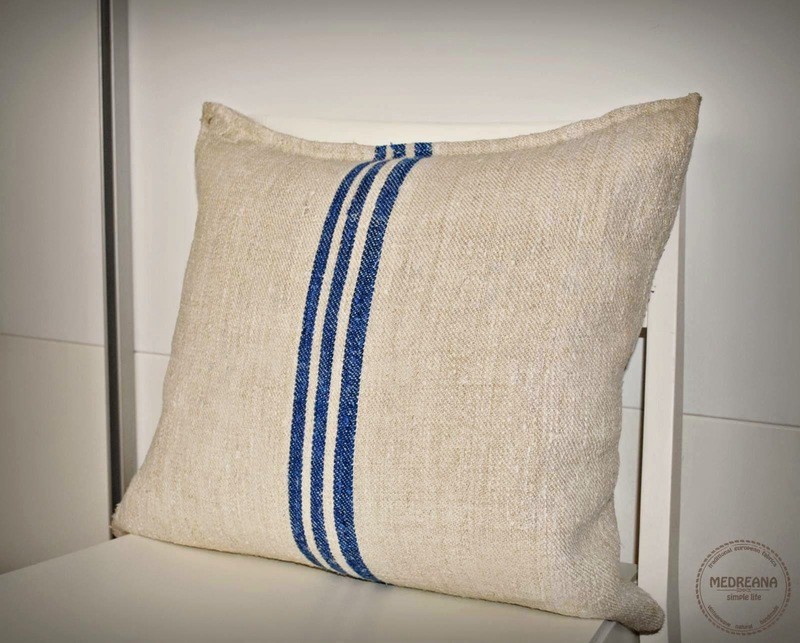 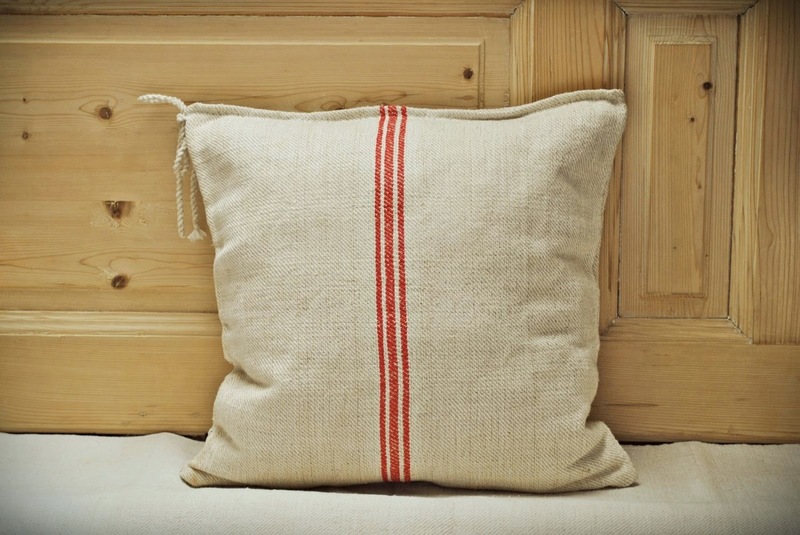 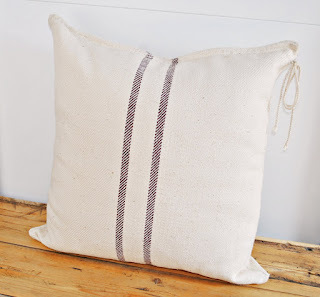 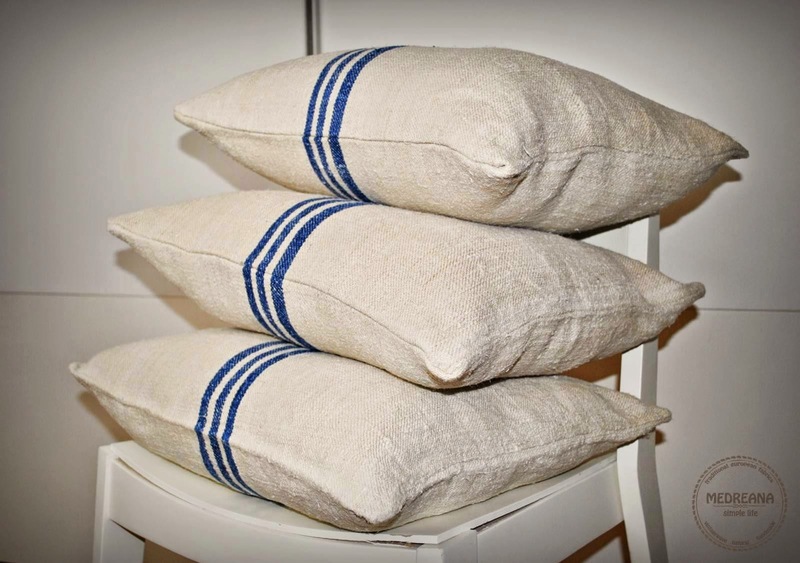 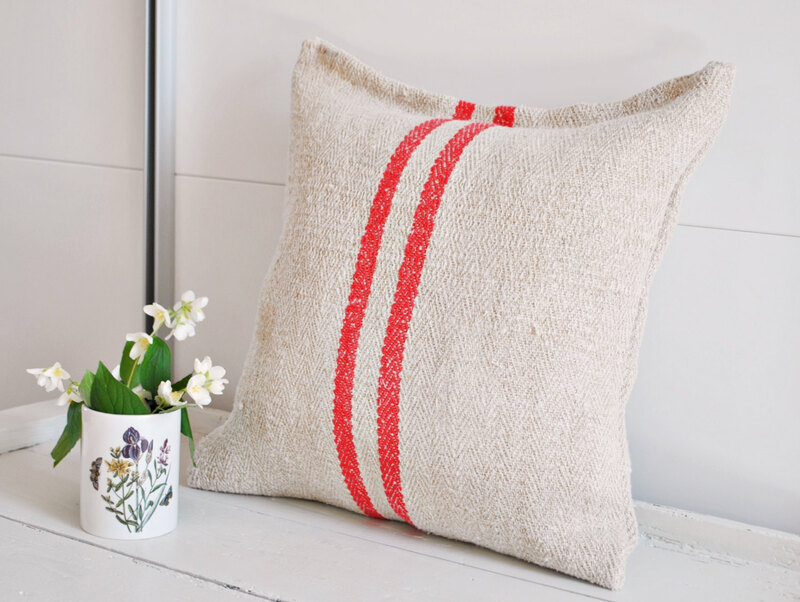 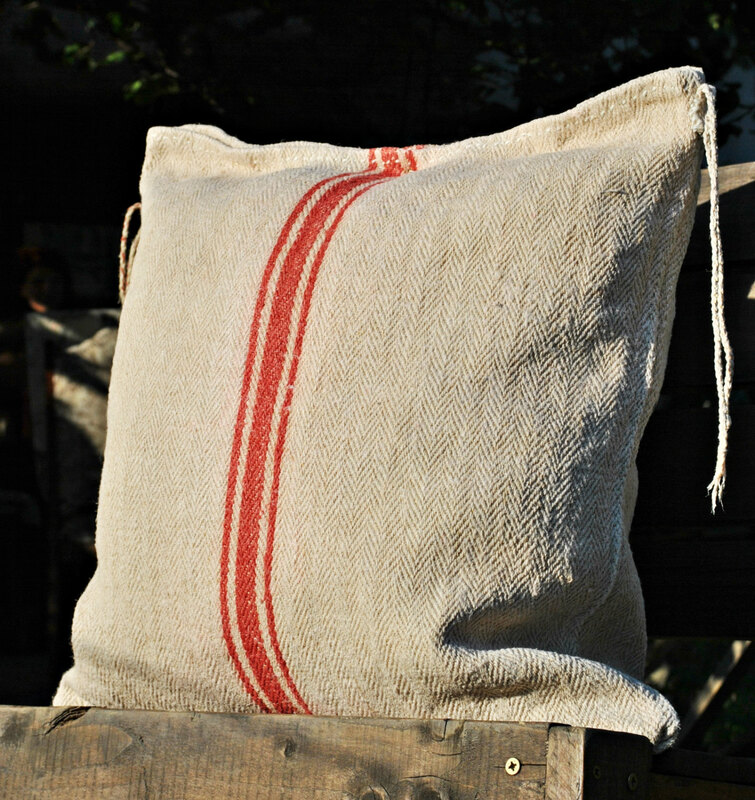 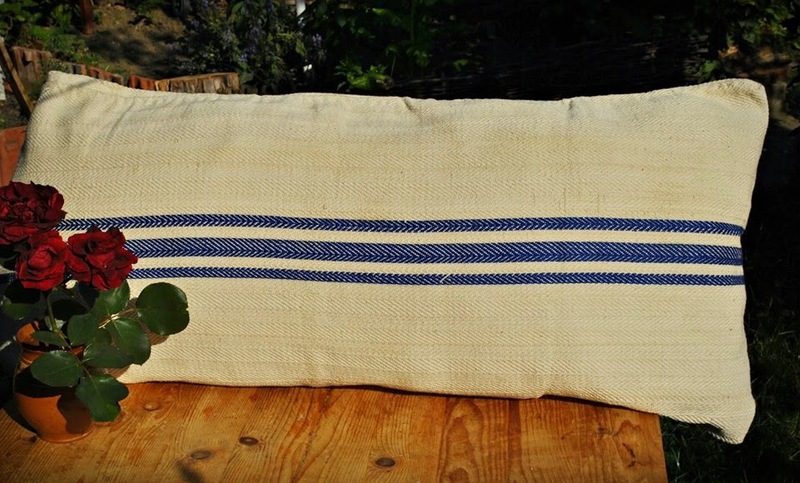 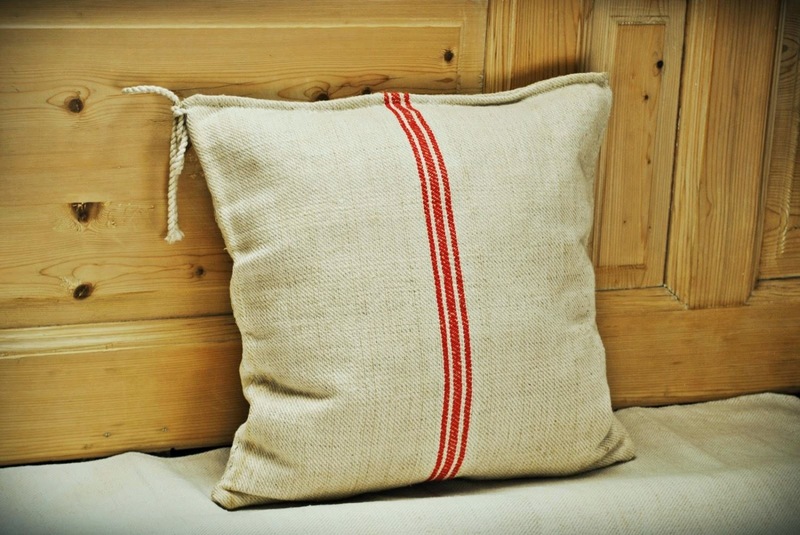 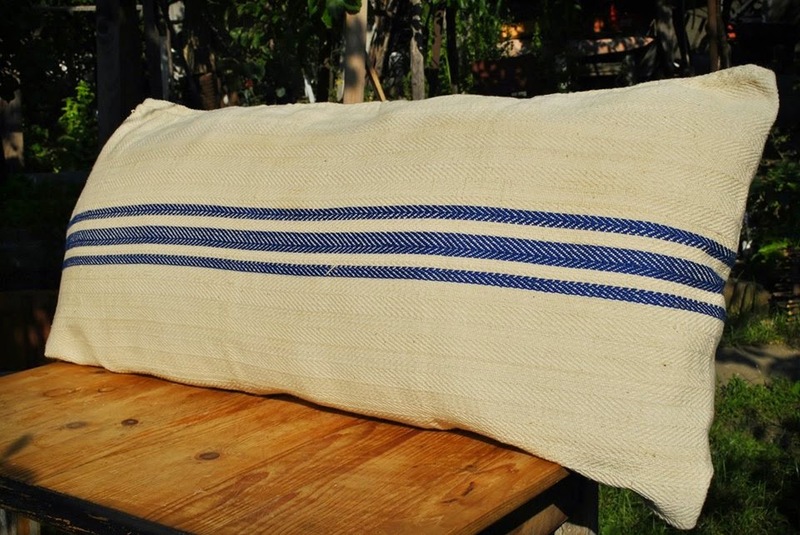 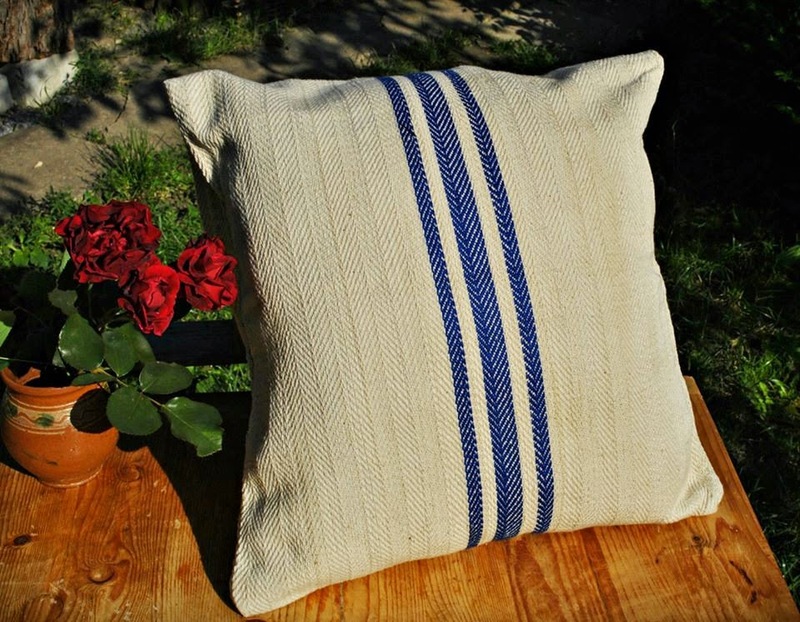 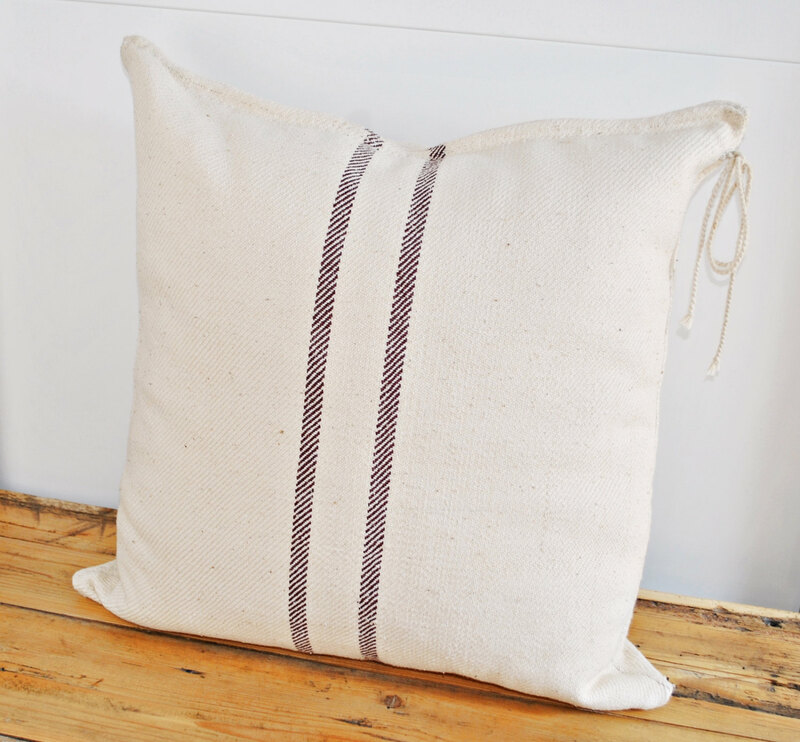 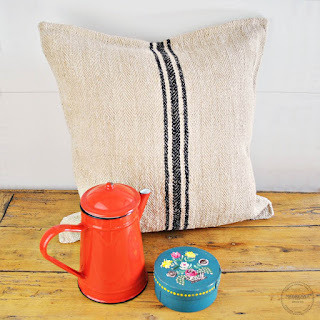 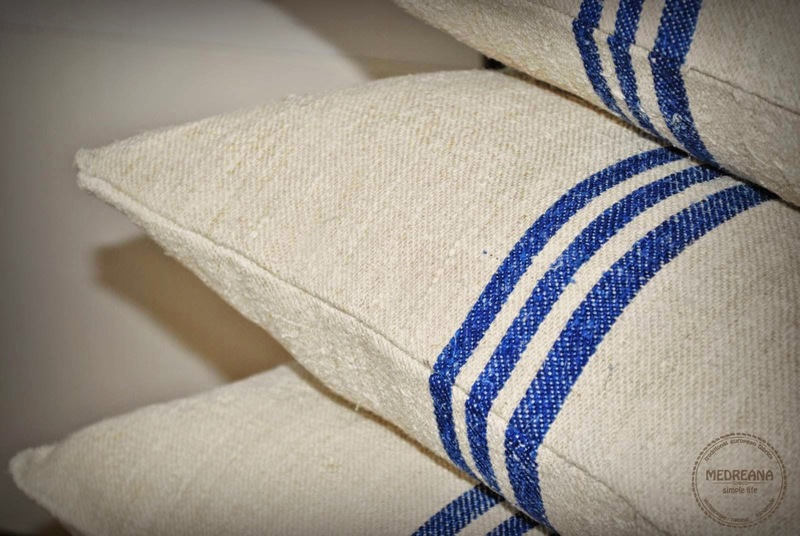 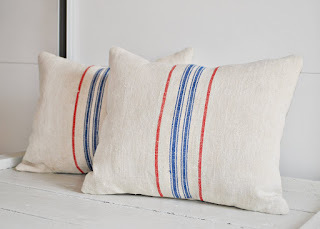 Made from a beautiful antique/vintage hand-woven hemp and cotton grain sack from Europe. 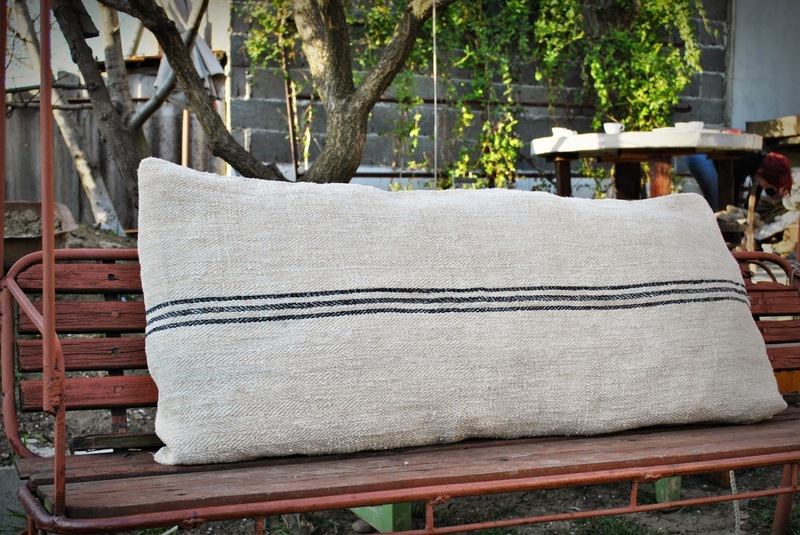 MATERIAL AND COLOR: Medium weight hemp and cotton linen material, hand loomed . 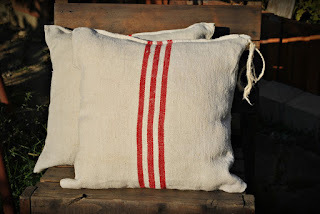 Three red stripes. 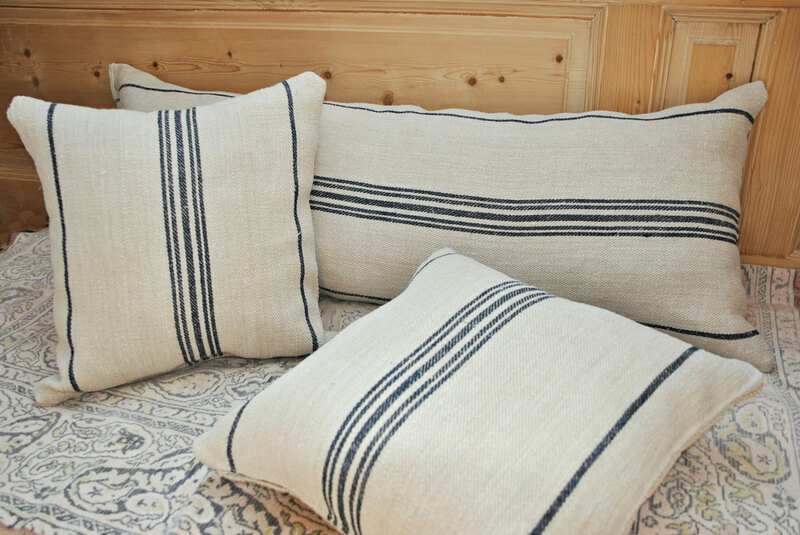 The stripes are handwoven on both sides. The fabric's tone is a pale warm natural oatmeal. MATERIAL AND COLOR: Heavy hemp linen material, hand loomed in a herringbone pattern. 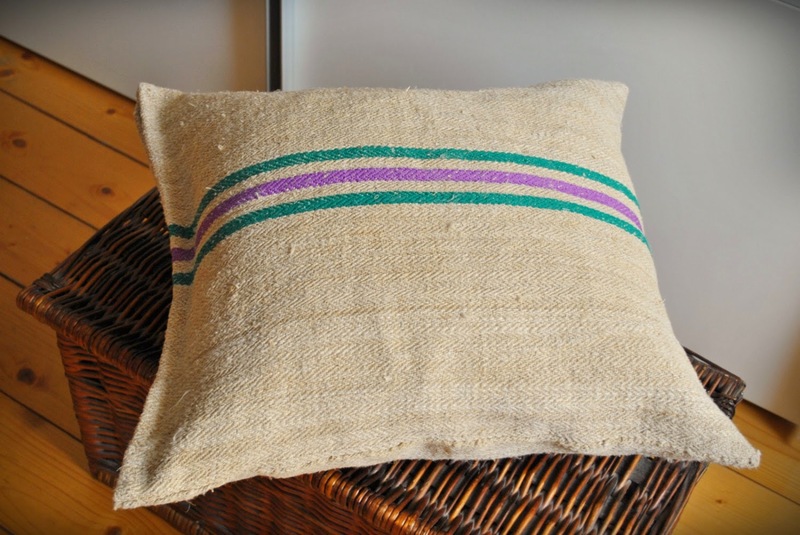 3 stripes running down the middle - two green stripes and one central purple stripe. 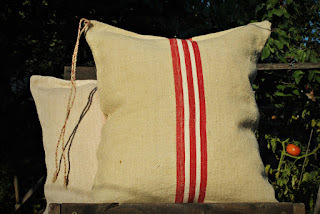 The stripes are handwoven on both sides. 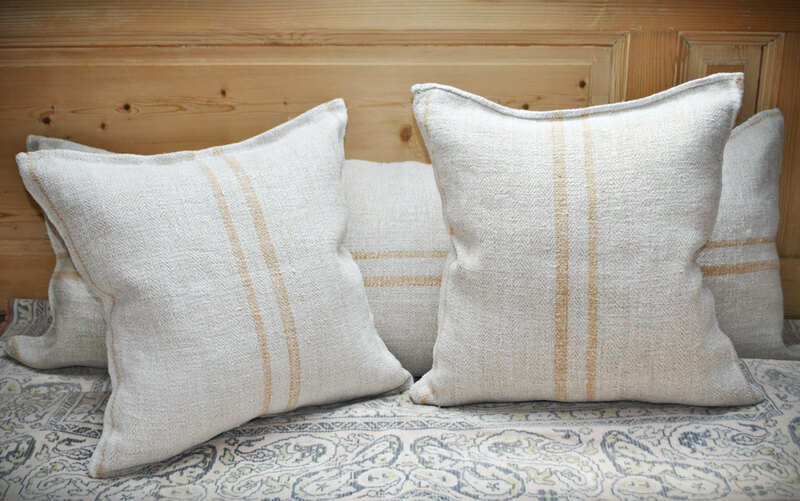 The fabric's tone is a warm natural straw tone. 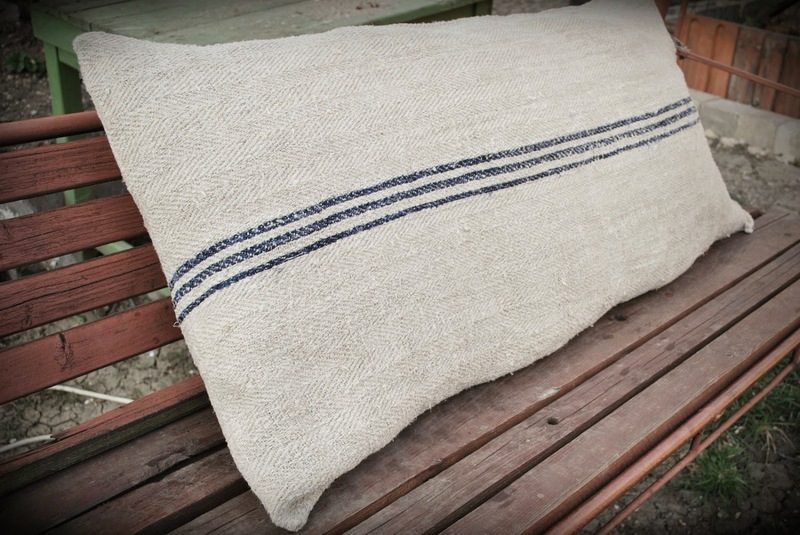 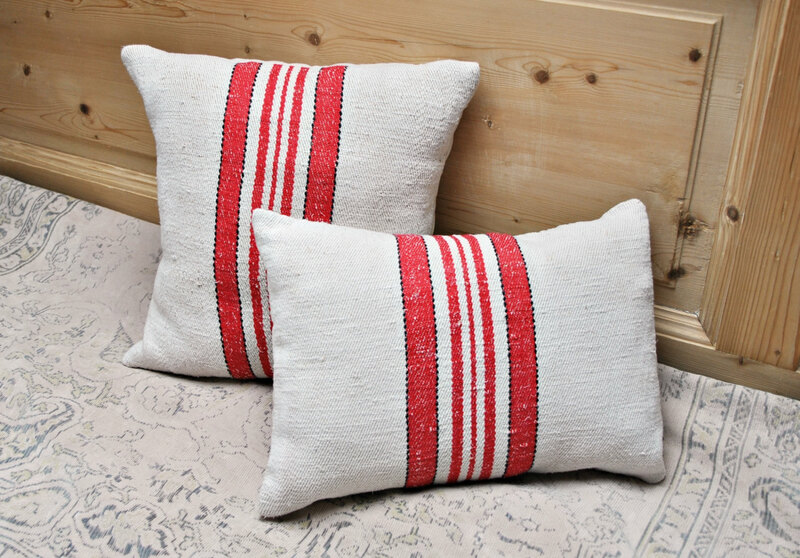 Made from a beautiful vintage handwoven cotton grain sack from Europe. 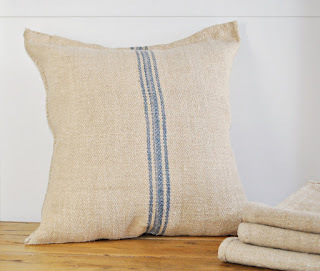 MATERIAL AND COLOR: Medium weight cotton linen material, hand loomed in a herringbone pattern. 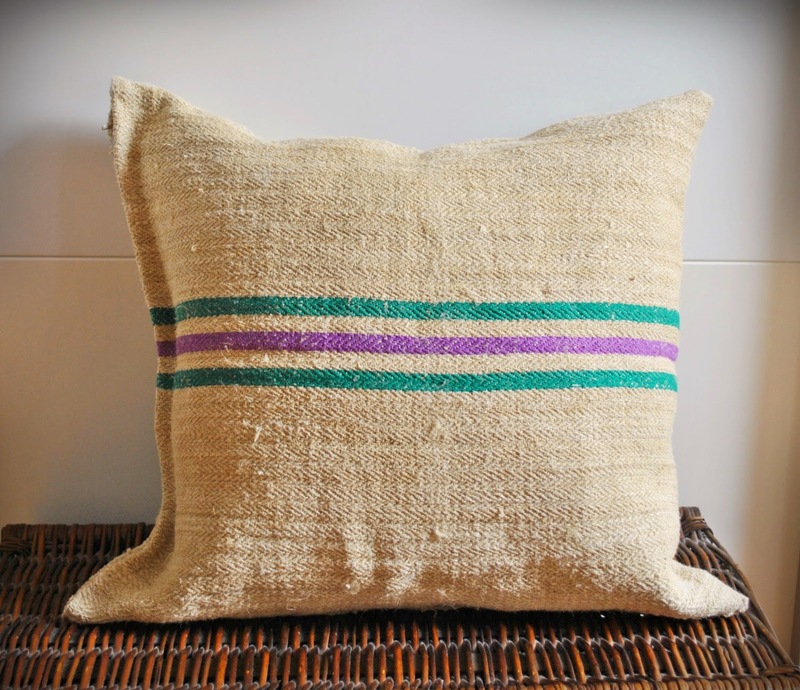 Two blue stripes and one central purple stripe. 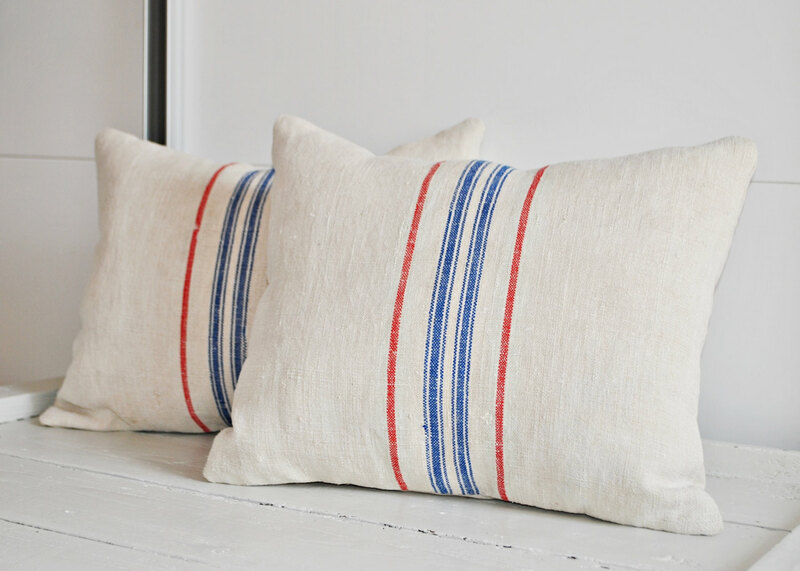 The stripes are handwoven on both sides. 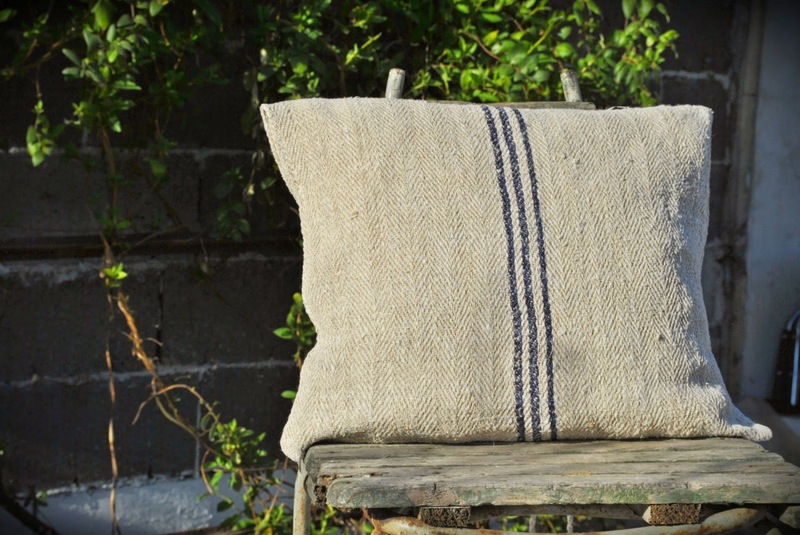 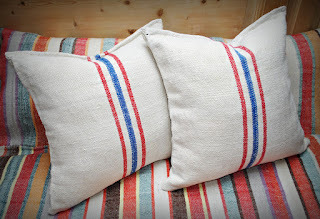 Made from a beautiful vintage handwoven cotton and hemp grain sack from Europe. 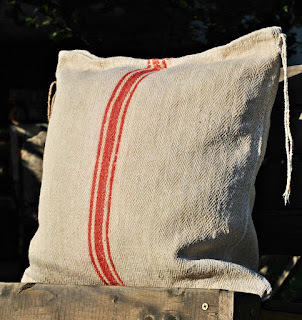 MATERIAL AND COLOR: Medium weight cotton and hemp material. 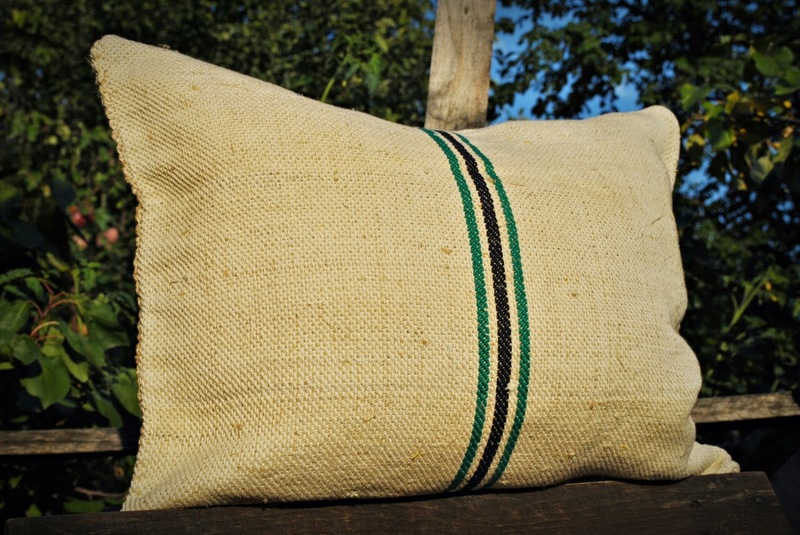 Two green stripes and one central black stripe. 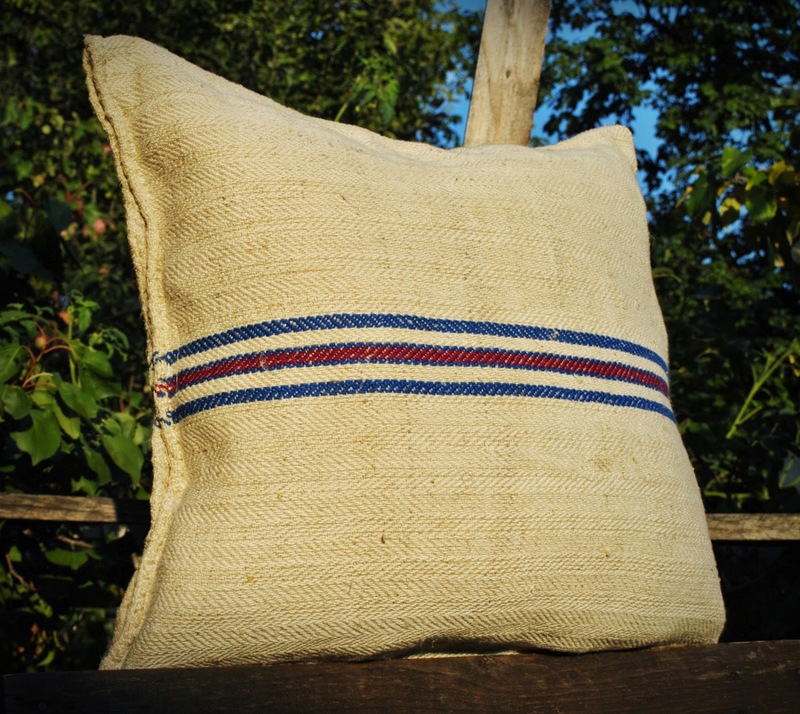 The stripes are handwoven on both sides. 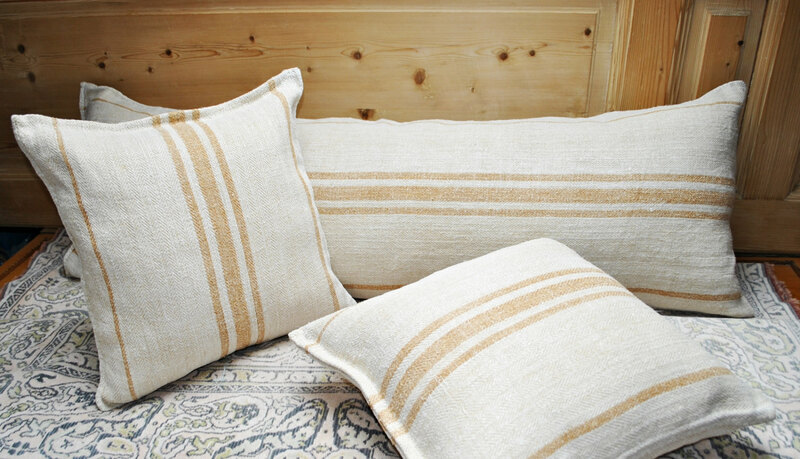 The fabric's tone is a pale warm natural straw tone. 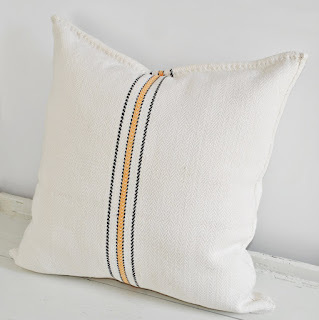 Black stripes. 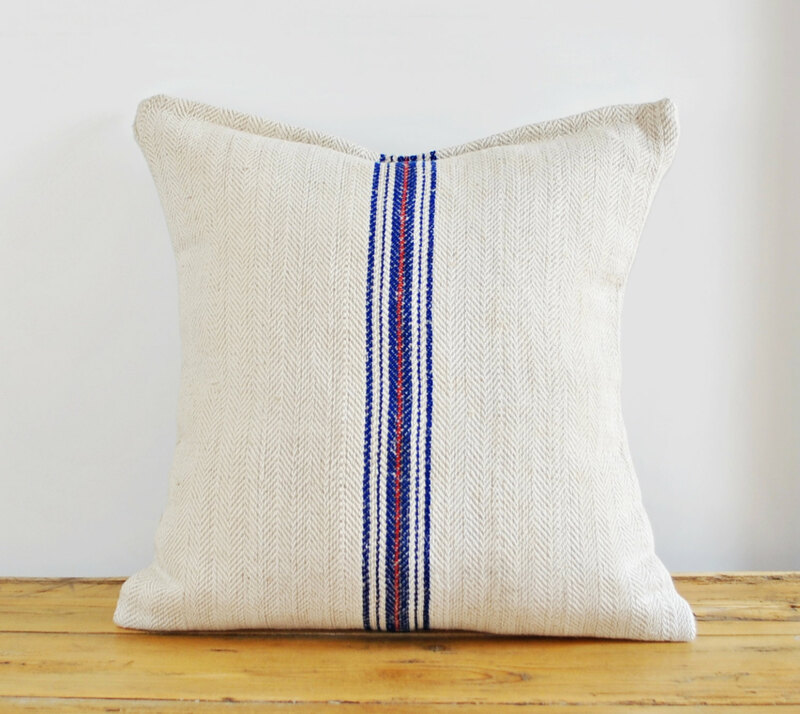 The stripes are handwoven on both sides. The fabric's tone is a pale warm natural oatmeal tone. 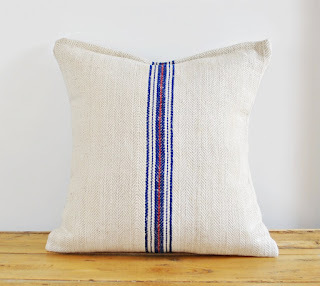 Blue/indigo stripes. 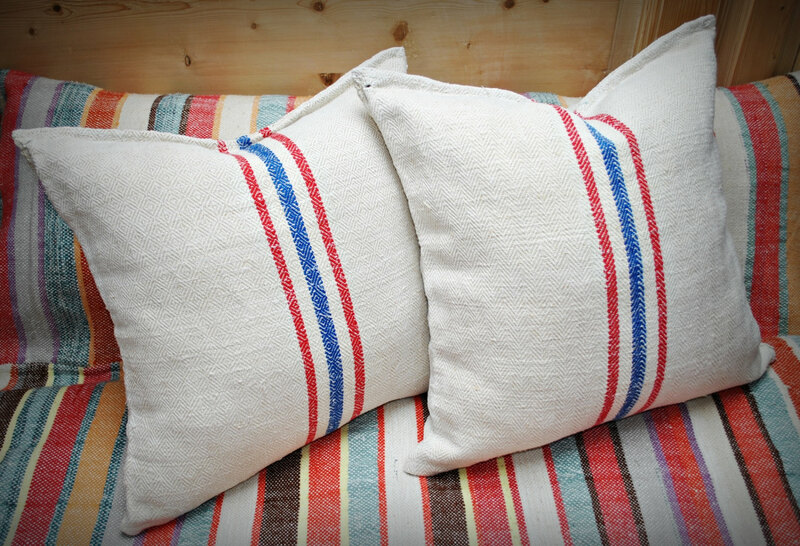 The stripes are handwoven on both sides. 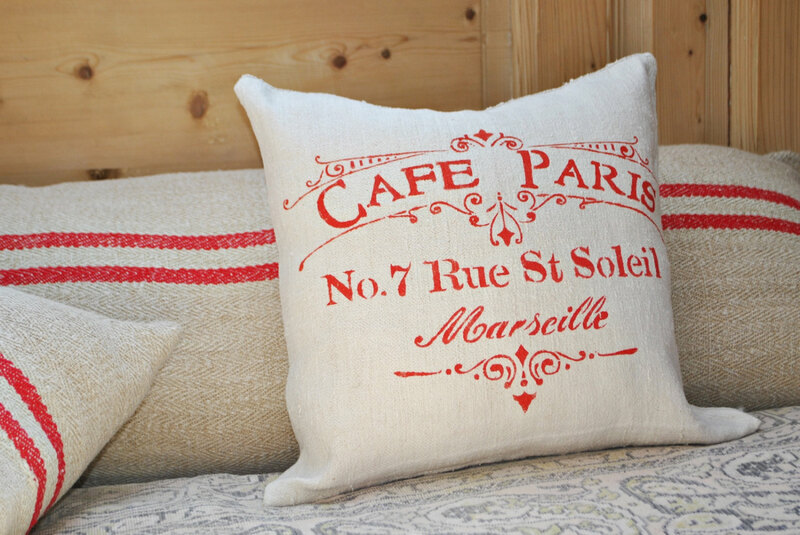 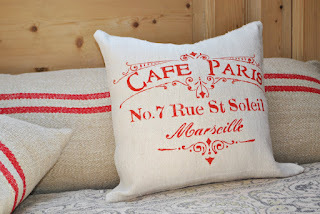 It would be a great holiday accent pillow or simply fit well into your farmhouse , in a rustic décor or a beach house. 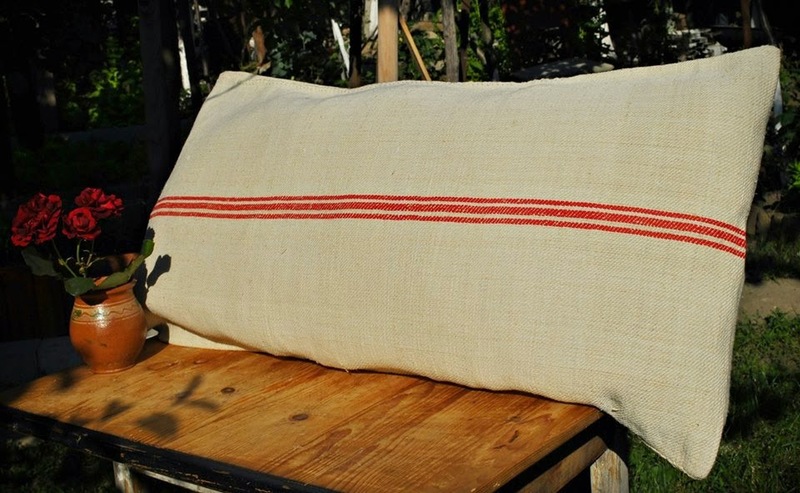 MATERIAL AND COLOR: cotton handwoven fabric. 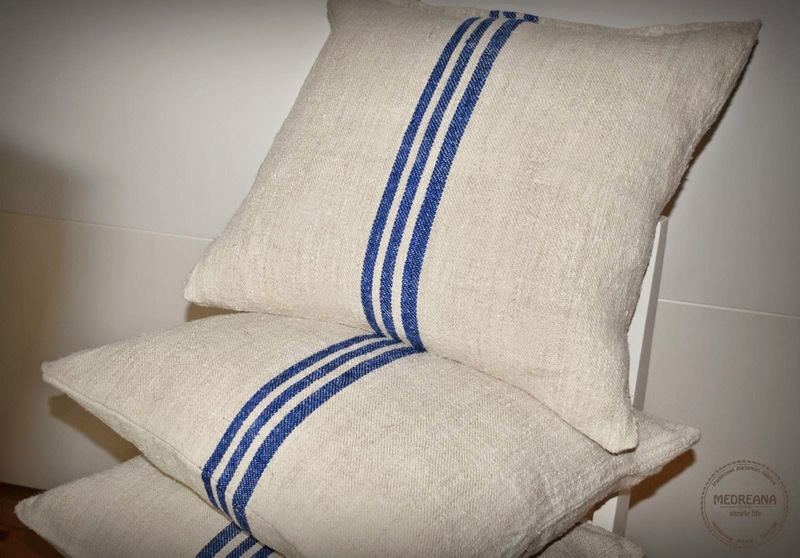 Blue cobalt stripes. 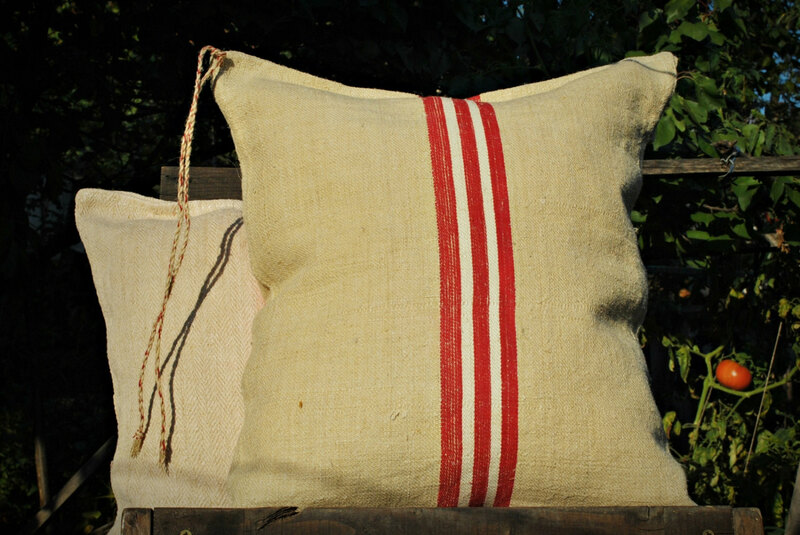 The stripes are handwoven on both sides. 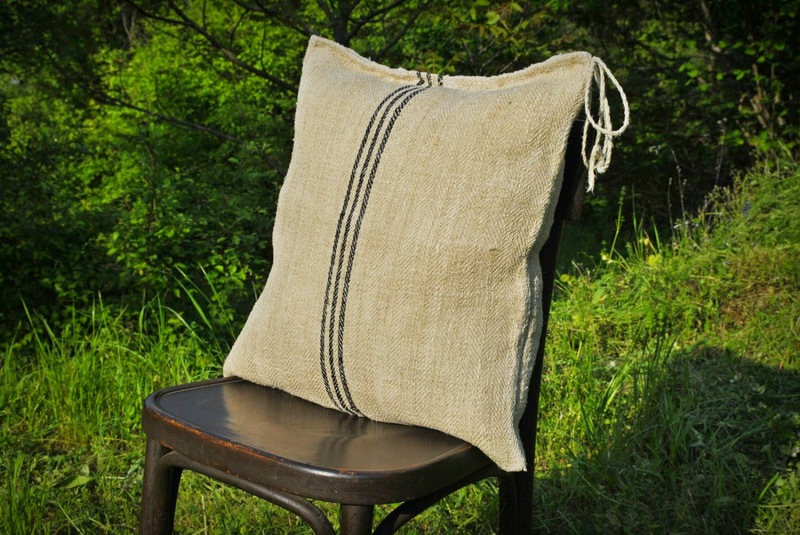 It would be a great holiday accent pillow or simply fit well into your farmhouse or rustic décor or in a beach house. MATERIAL AND COLOR: Medium weight cotton linen material. Three blue cobalt stripes. 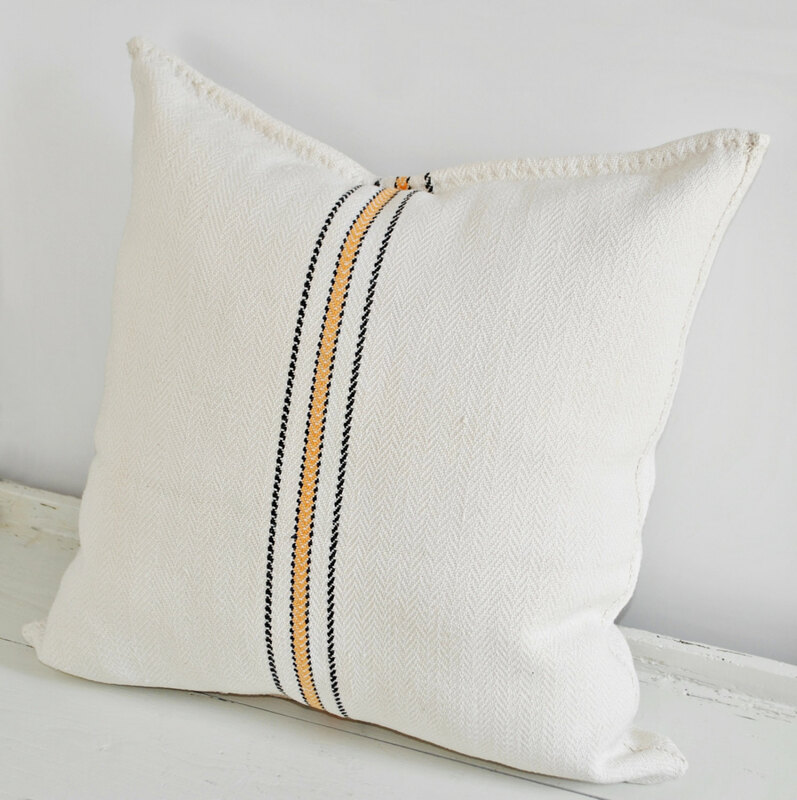 The stripes are handwoven on both sides.